We have a group chat on WhatsApp with our neighbours here in the staff village in Letaba. It is convenient to keep each other posted on any sort of emergencies, power outages, or to check if some one needs something from town. We live very remote, and you can’t exactly drive back to town for an hour if you forgot the milk, so it helps if one of the neighbours can pick something up for you. But the group chat is also nice to share interesting sightings close to the staff village. One morning a few months back, I got a message that four wild dogs had killed an impala on the entrance road to the staff village. Now that obviously is an opportunity too good to pass up! So the boys and I dropped what we were doing and got into the car. Excitement all round! My neighbour told us she saw the dogs past the emergency road services buildings. So that is where we were heading. I wondered why there were only four wild dogs. We see a pack quite regularly between Letaba and Phalaborwa. I believe it is called that Phalaborwa pack and they are a lot bigger than just four dogs. Maybe these four split off from the main pack for a bit? Or they started a new pack of their own? It was just after 7 o’clock and the workers were arriving at the site of the emergency road services. But that did not seem to bother the wild dogs at all, whom we found a mere 100 metres from there! They were right next to the road! The impala that they had caught was almost finished. Only the head and neck were untouched. As well as some of the skin on the side of the ribcage. I don’t know if you have ever witnessed a wild dog kill. It is quite amazing. I was on a sunset drive from Lower Sabie once, with my friend who was head guide there at the time. Minutes out of camp, a pack of wild dogs came out of a no entry road and killed an impala right in front of the truck! They finished it in the space of minutes! The sounds of bones breaking and meat being torn off are still fresh in my memory. As well as the high pitch chirping and chattering of the dogs while they were busy devouring this poor impala. So this impala kill we were now watching right next to the car, must have happened not even half an hour before. We watched as the dogs were starting to lie down next to what was left of the impala. They were taking turns, having a last few mouths full. I absolutely love watching wild dogs. They are so pretty. Not one of them looks the same. Each with a different pattern of spots and amount of white on their tail. We don’t get to see them relaxing like this very often. They are very active and often on the move, so this was extra special spending time close to them like that. Unfortunately I had to turn around after only a short 15 minutes to handle a code brown situation on Jack. When I came back after changing his nappy, the dogs were gone. They had left the rest of the impala and I am sure the resident hyenas were very grateful for that later that evening! We have seen these four wild dogs a few more times after that in the staff village. Steven told me that when I was in Holland with the boys this summer, they came running right past the house!! How I wish I could have seen that! 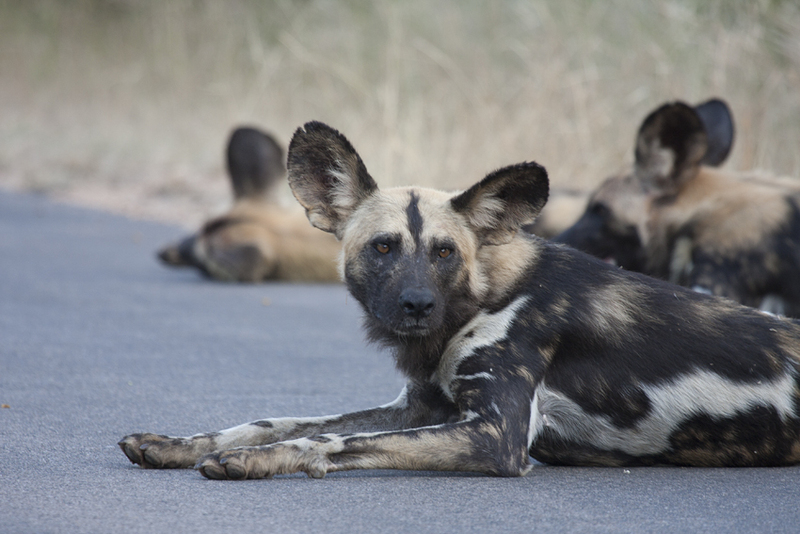 I saw on the sightings board next to the shop this morning people reported a wild dog sighting close to Letaba. I will be on the look out for them!! Great sighting Linda! And one of the perks of living in Kruger. I wonder if there are animals that you have not seen and would love to? We have aardvark and pangolin on our list among others (for example we have never seen a porcupine in Kruger!) and we once had a rather brief sighting of a civet, so would love to get a longer look. Between you and Steven your boys are going to grow up knowing an enviable amount about the bush so naturally. Hi Sal! Yes, aardvark and pangolin are at the top of my list too! I would love a good caracal sighting to be able to take some nice pictures. I have seen one or two, but those were so quick I never got a chance to take a pic! Steven has seen pangolin on his trail only once. They are so rare where we are. Hopefully when we move to the south we get a chance to see one! Thanks Liza! Isn’t your trip coming up soon? Wow I loved your description of the wild dog kill. Once upon a time in around 1969 I was in the park with my parents and grandparents (we used to go every 3 years) and between Satara and Letaba an impala came out of the bush next to a causeway and was killed right up against our car by a pack of about 12 wild dogs. It was almost all eaten while still alive and it all took about 20 minutes in total for there to be nothing left but a spot of blood on the gravel road. Yes, gravel, no tar roads in those days. What an incredible experience and my dad had it all on film. Sadly the film got damaged years later and I no longer have it, but I have the memories and pictures in my mind. I so envy you, I would love to visit the park again, havent been back in about 39 years now and probably never will as it is beyond my means. Thank you for bringing us these wonderful stories. Yet again another brilliant account of living in the wild”. So lucky! hahaha well a code brown with possible leakage is definetely a reason to leave a nice sighting! !